DISCOVER THE MIRACLE OF LELESHWA OIL! midges, biting flies and other blood-sucking insects. Leleshwa (Tarchonanthus camphoratus) is a shrub that grows in the arid desert of Southern Africa. 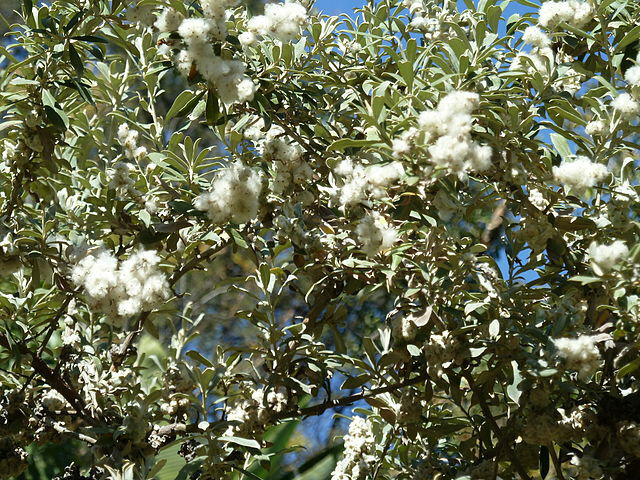 The plant has considerable anti-parasitic and antimicrobial qualities. In the wild, animals are often observed eagerly rubbing their bodies against the plant’s foliage, and those that do have been shown to have far fewer ticks and other ectoparasites than those that don’t "use" the bush. Leleshwa oil is also known for its skin healing and nourishing properties, which are largely attributable to the strong antimicrobial properties of alpha Pinene, Cineole, endo-Fenchol, alpha-Terpineol, Terpinen and various other constituents of this amazing botanical oil. Calendula extract – THE classic skin support herb. Soothes the itching and speeds healing. Geranium oil – contains antibacterial, antifungal and antioxidant properties that serve to inhibit infection, and astringent actions that reduces inflammation and itch caused by insect bites. The oil also contains geraniol and other compounds that are known to repel ticks and other parasites. Lemongrass oil - contains citral and geraniol, both of which work well to deter insects such as mosquitoes, ants and fleas. It also helps soothe the skin while its aromatic principles offer a calming effect. Peppermint oil - Helps relieve itching, with an invigorating, cooling sensation upon the skin. Cinnamon bark – Small amounts of cinnamon bark oil help stimulate and accelerate healing by increasing capillary circulation in the skin. It is also rich in eugenol, a well-known insect repellent. Cedarwood oil – great for skin and coat conditioning. It is well known as a safe and reliable flea repellent.